The Indonesian government has announced a presidential instruction, which ordered ministers and regional administrations to ban issuing permits for new plantations for the next three years. We welcome this much needed action. Orangutans can survive, if given a second chance. Three years ago, in September 2015, we rescued an adult orangutan and her 6-year-old from an oil-palm plantation, which they had entered to escape raging forest fires. 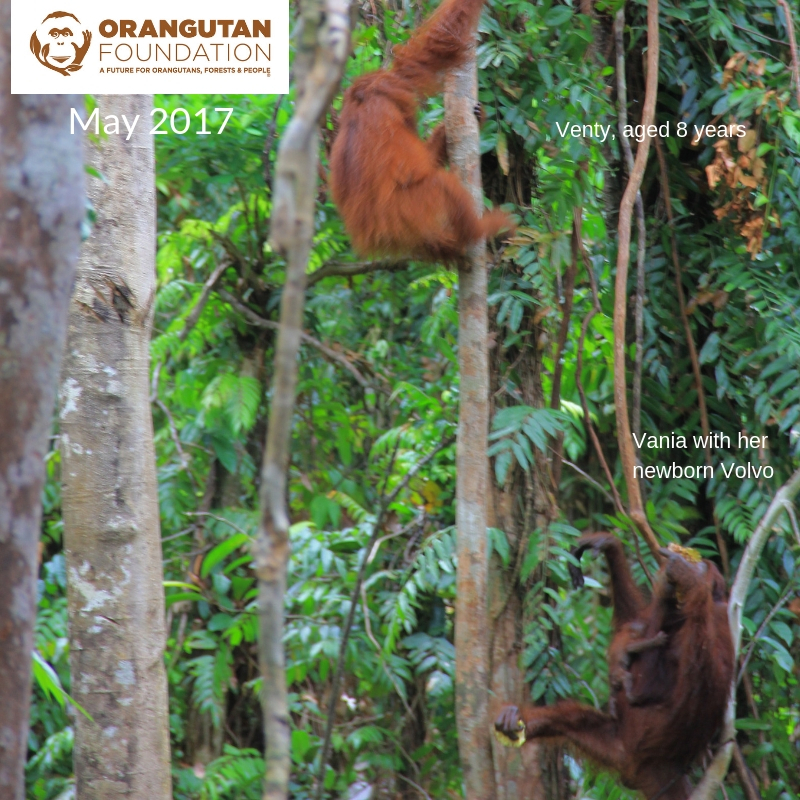 Our rescue team managed to capture both orangutans. They named the mother Vania and her offspring Venty. They were released into the protected Lamandau Wildlife Reserve, Central Kalimantan, Indonesian Borneo. In 2017, Vania was spotted with a newborn, who we named Volvo. Venty, now aged 8-years-old, was still around too. 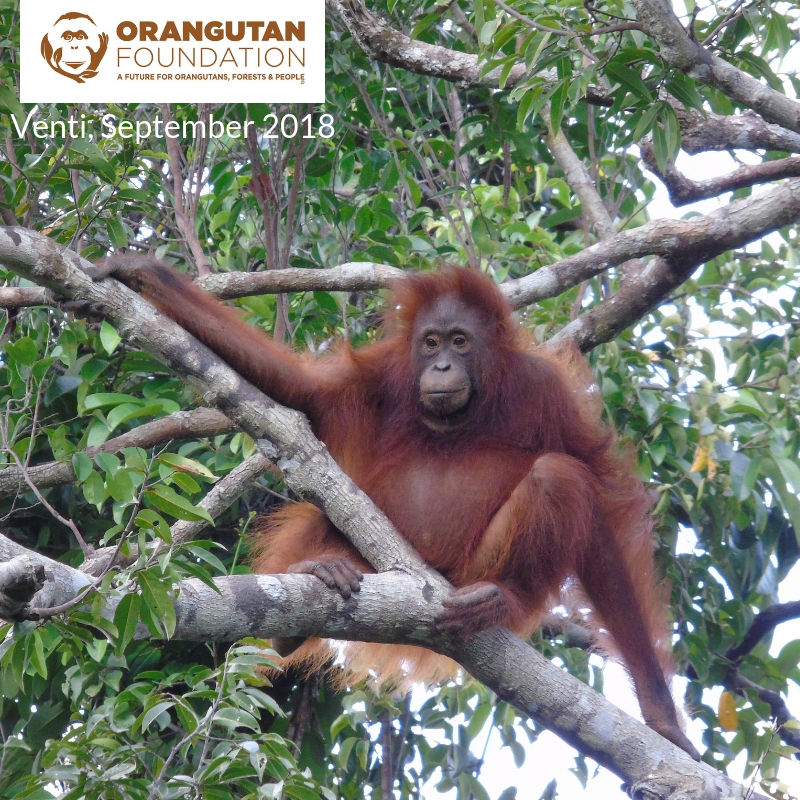 This month, field staff at Camp Buluh, in the wildlife reserve, saw Venty (image below) by herself in a tree. They then saw Vania with her very healthy looking one-year-old Volvo. These orangutans live in a protected area, which is guarded and patrolled by Orangutan Foundation. However, 80% of wild orangutans live outside protected areas. This 3-year ban on plantation expansion is the life-line this critically endangered species need. 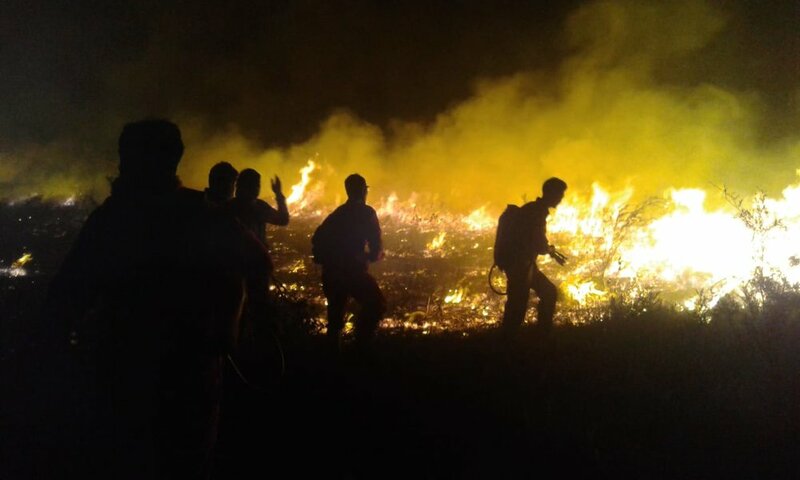 Orangutan Foundation have been tackling fires only a few kilometres from the boundary of the Lamandau Wildlife Reserve, home to some 500 critically endangered Bornean orangutans and many other threatened species. Our committed team of Indonesian staff are working with the Indonesian Wildlife Department and the local community to extinguish the fires. The threat of forest fires is returning as the dry season in Central Kalimantan continues and 2017 looks set to be one of the hottest years on record. We are prepared and are on alert to ensure these fires do not spread. All of our guard posts store fire fighting equipment and we have supported fire fighting training. We have witnessed firsthand the devastation caused by fires. During October 2015, fires in Tanjung Puting National Park and the Lamandau Wildlife Reserve burnt through thousands of acres of forests. The clip below, with Indonesian text, highlights the problem. Forest and land fires can be prevented if all parties support and commit to not burning the forest and land for any purpose. Support our vital work to ensure a future for orangutans, forests and people. A blind Bornean orangutan, who was rescued from an oil-palm plantation, may have her sight restored and live in the wild again. The Orangutan Foundation have been caring for the orangutan, named Aan, since 2012 when she was found with 104 air rifle pellets in her, 37 lodged in her head. A three-hour operation removed 32 of the pellets but she was left blind which meant she couldn’t be returned to the wild. An ophthalmic surgeon, Claudia Hartley, visited Aan to assess the permanence of her blindness. On examination, the ophthalmologist discovered there is a very high chance of restoring sight to one of Aan’s eyes. Claudia Hartley will return to Central Kalimantan, Indonesian Borneo, with colleagues and specialist equipment in February 2017. They will operate to remove a cataract and, if successful, Aan will be returned to the wild, despite still being blind in one eye. Aan is currently living in a purpose-built enclosure in the Lamandau Wildlife Reserve, which is where she will also hopefully begin her transition to living wild again. The Orangutan Foundation actively protect the forests and precious wildlife within with guard posts and river patrols. This year, an extension to the Reserve was agreed by the Indonesian Government, adding an area the size of Guernsey to the protected forests. At a time when orangutans are critically endangered, due to habitat loss, this is a conservation success story. What role can technology play in conservation? We at the Foundation love harnessing new technology to give us a better understanding of the current state of the rainforest habitat we work to protect. Our latest project involves integrating drone technology into our habitat assessments, as well as into our orangutan rescues. Drones are remotely controlled cameras which can be flown over rainforest areas and used to take aerial photos or video of the surrounding landscape. We have now been using drones over the Lamandau Wildlife Reserve for a couple of months, and with impressive results! For example, these images (below) were taken in order to assess the scale of the damage in the reserve caused by the forest fires late last year. By viewing aerial footage of the damage, we can best place our efforts to protect remaining forest with the introduction of strategically positioned guard posts and forest restoration projects. In using these drones during our orangutan rescues, we are also better equipped to assess the surrounding area and determine how the orangutan became displaced. The striking image below gave us a clear and devastating indication of how orangutan habitat had been so greatly fragmented due to the expansion of oil-palm plantations in the area of Sampit (Central Kalimantan). We are gaining a great deal of insight from the use of new technology such as this, and we couldn’t be doing so without the backing of our generous supporters. In being able to share these discoveries and insights with you, we feel you are able to better understand our work and the challenges we continue to face. We love to explore the internet in new ways to gain support and raise awareness of the work we do. Social media is another amazing tool to promote knowledge and effectively ‘spread the word’ about the beauty and wonder of orangutans and their rainforest home, as well as highlighting why we desperately need to protect it. We connect with supporters on Twitter and post announcements on Facebook, whilst using this blog to help individuals to gain a deeper and more personal understanding of what we do in the field. In light of this acknowledgement, we are excited to announce the launch of the Orangutan Foundation’s Instagram account in honour of Rainforest: Live! Follow our Instagram (orangutan_foundation) to see new images and clips from our Indonesian staff as they experience the true wonders of the Indonesian rainforest!